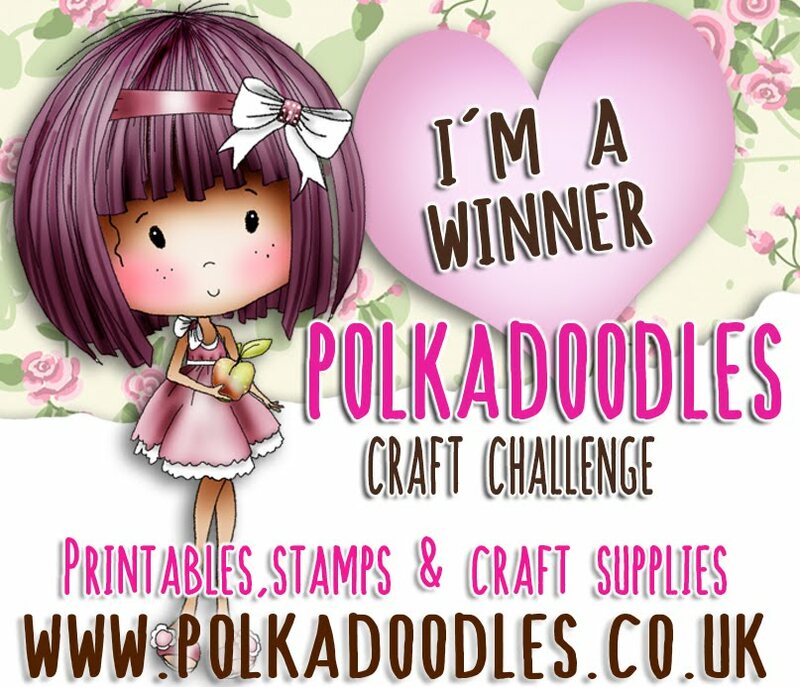 Welcome to another Friday and a Polkadoodle challenge! It's Enfys here, setting the challenge for this week and the Polkadoodle team have a new element to the challenge this week, which we are going to make a regular feature once a month. 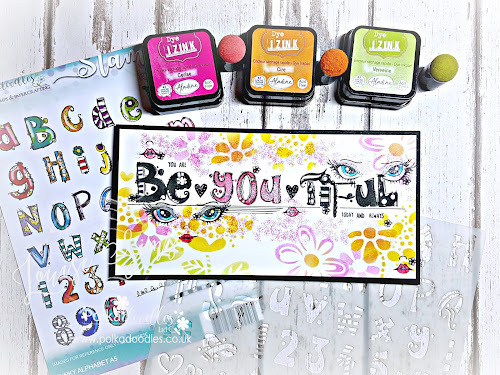 We are calling it Stashbox Stamp Week, which basically means that we can dig out our favourite stamps and use them with our Polkadoodle papers and pretties. Of course, our favourite stamp may well be a Polkadoodles one...but that's okay too. Congratulations! Please email Nikky with your placing and 'Challenge 6 top three' in the subject field. Good luck with the challenge - the closing date is Sunday 6 March at 12noon GMT. Ruth: I've kept it pretty simple this week! Paper is from Sundae of Seasons (just love the check!) and the image, coloured with Aquamarkers is Penny Black. The two ribbons that I've used are from the Scrap Store and I made my own charm with beads from a very lovely friend! D'Anne - For this card I used the green digital paper collection from the Sundae of Seasons CD and the digital Shamrock Bouquet stamp was created by Claire Brennan. I’ve colored the shamrocks with Promarkers, cut them out and attached with dimensionals. Enjoy your day. 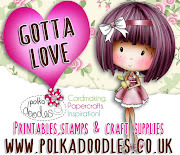 Saskia - Magnolia meets Polka Doodles! All the lovely papers and ladybugs are from the Paper Boutique Vol I cd-rom! Claire I have used a mixture of elements, backing papers are from Paper Boutique Vol 1, flowers are from Candy Doodles and Sentiment from Sundae of Seasons Cd. 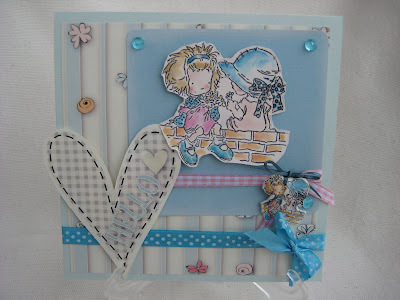 I have used a Leanne Ellis stamp by Sugar Nellie from my stash. Lis-m For my card this week I have created a scene in the garden using the Sundae of Seasons cd. I found everything I needed on there, and finished with my stashbox stamp - a gardening Hanglar. I used 2 ribbons and a gardening charm from my stash. Audrey For this card I used the CD All Around And Everywhere for the digital paper. The stamp is from Hampton Art. I did a little paper piecing for the wings and the present and I colored the rest of it with Copics. The ribbon is from my stash and I got the charm at Michaels. Colette - For this card I used elements from Sundae of Seasons (fairy garden and toadstool) and papers from Candy Doodles-plain candies, Paper Boutique III-dotty paper, and a stampie from Sugar Birdies for the sentiment. The fairy image is a Charmed Delectable Enchanted Pixie stamp, a RAK from Ruth, coloured with Promarkers and Sakura stardust pens. The wide pink ribbon is from a local craft shop, the narrow ribbon is from stash and coloured with promarkers (it was white) and the two little dragonfly charms on the sentiment, I've had for so long, I don't remember where they came from. Miria. For my card I used a Lily Of The Valley stamp coloured with waterpencils and I found the perfect paper and sentiment to match it on All around and everywhere. I added the ribbons from stash and made a charm using the same stamp on polyshrink. 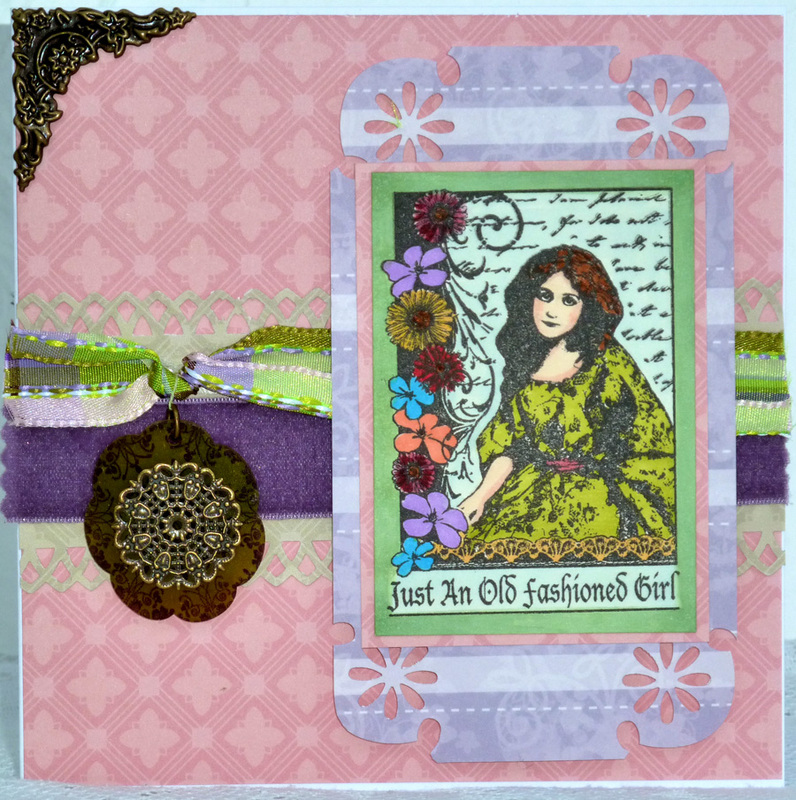 Fliss - I've made a vintage style card with a Crafty Individuals stamp from my vast stamp collection. I coloured the pretty collage with various Promarkers. I used papers mostly from the Paper Boutique Volume 3 CD and the lilac ribbon one is from the Sundae of Seasons CD. I added some punching with the Martha Stewart Arch Lattice punch and made a charm with stamped shrink plastic with a brass stamping added for interest. Full details are on my blog. Tracie: I used a Whiff of Joy stamp from my stash and used papers from Sundae of seasons to paper piece the umbrella, hair bows and top. I added a little shading on these parts with my promarkers for a little added depth. I also added a bit more of the same backing paper and decoupaged the gorgeous spotty wellies, also from Sundae of Seasons. The ribbons (ok so its twine and lace but shh!) 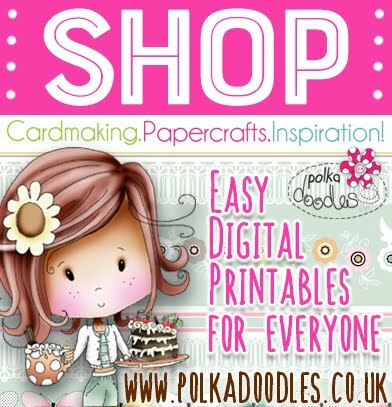 are some of my favs from the Polkadoodle shop. Finished with a charm from my stash and a design runner sentiment. 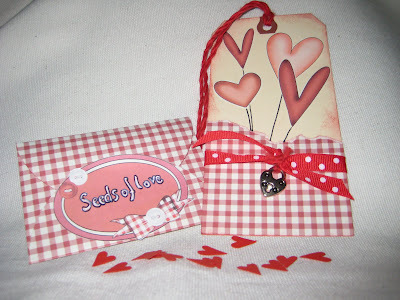 Lou: I have used a set of stamps from "My Favourite Things" and all the papers are from the Paper Boutique Volume 3 CD. The images have been paper pieced an covered in Crystal Lacquer for added "shine"! Pleated ribbon is made from paper and additional ribbon(s) from stash. Unfortunately I couldn't find a charm or any shrink plastic to make one . . . . and local craft shop didn't have any shrink plastic either . . . so have used a glitter bead thing as my charm. I made a "boy" and "girl" card using the same paper designs just changing the background paper to co-ordinate with my dinosaur. Good luck - the challenge is open until Sunday 6 March at 12noon GMT. Week 7 Challenge - Chocolate! Hello, it's Saskia here for this week's challenge! Our 'boss' (sweet Nikky) calls me 'the Belgian chocolat girl'! So... make a yummy project or card with 'chocolat colours' or something with some real chocolat! Our Design Team has some great inspiration for you! And here is the inspiration for you - a chocolat picture! Before we look at the Design Team samples please give a warm Polkadoodles welcome to our newest member - Ashley Lydia! The challenge runs until Sunday 27 February at 12noon GMT and please remember our rules when entering! Congratulations! Please email Nikky with your placing and 'Week 5 top 3' in the subject field. Onto the Design Team's samples! Ruth: I've used the fab chocolate cupcake decoupage from Candy Doodles, layered it all up with foam pads then added glossy accents to the chocolate elements plus glittered the ribbon around the cupcake. Yum! 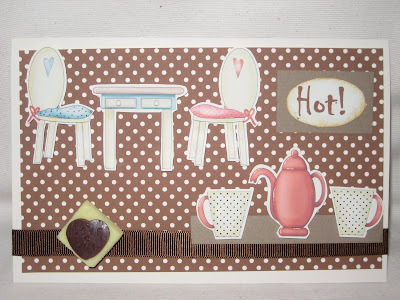 Miria My card is for hot chocolate lovers and I found all I needed to make it on Sundae of Seasons, from the paper to the coloured stampies. I've just added a sentiment from my computer, a yummy embellie and a ribbon. Enjoy! Audrey ... For this easel card I used the CD All Around And Everywhere for the circle sentiments and the bear and I used Sundae Of Seasons for the polka dot papers. I did a lot of hand stitching for this card because I thought it would go really well with that adorable bear. 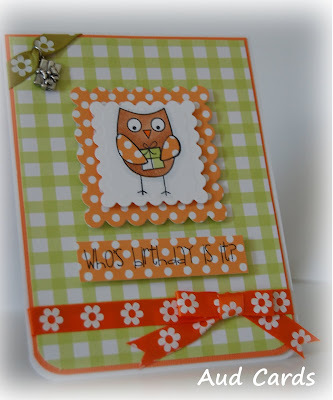 Saskia : I made this owl-card with the papers and template from the Paper Boutique Volume I cd-rom. I added a little smile at Mr Owl... yes, he's so happy with the chocolat hearts!! Lis-m: Just a quick card this week. I used the Sundae of Seasons cd for the papers, matted with chocolate cardstock, and I used Maggie from the flutterfly Fairies. I stamped her in a brown Le Plume pen, and used an aqua brush to blend the colour out. A simple button, and that's it! Emma, hello there, I made a set of secret little chocolate stashes﻿ for my poorly friend. I used backing papers from Sundae of Seasons and the topper was from All Around and Everywhere CD. The little envelope contains two chocolate mints - just enough to stop a craving. 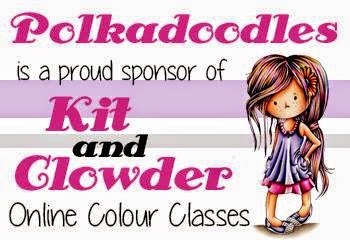 Claire: If you haven't popped by the Polkadoodles shop recently you should do... Nikky has some rather gorgeous woven ribbons for sale and I have used two designs on my Chocolate box. Also elements from Sundae of seasons and Back to nature cds. Colette - I went for a chocolate, strawberries and cream colour scheme using papers and the fabulous cake stampies from the Sundae of Seasons CD rom, I added fluffy stuff to the large cake for the cream and glossy accents to the chocolate drops on the small cakes, scrummilicious! 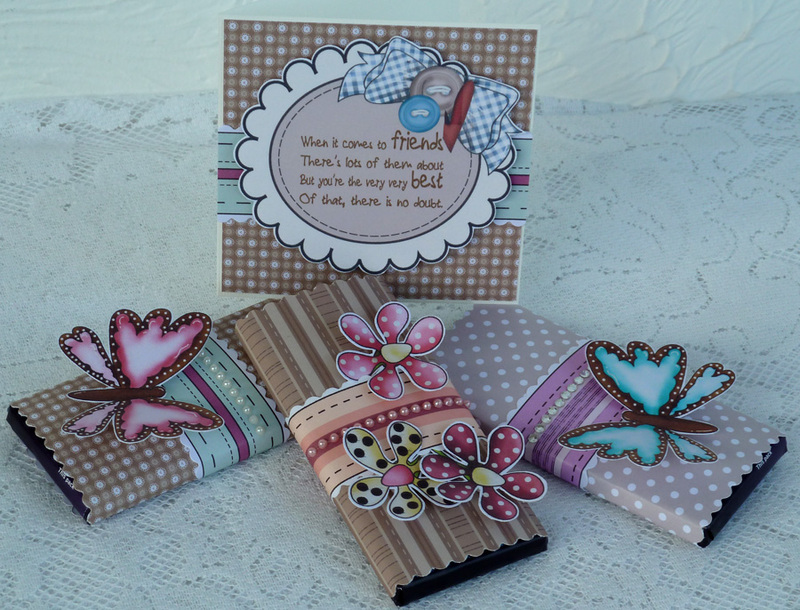 Fliss - I've made some little chocolate bar decorated covers with a matching gift card just perfect for giving to a chocoholic friend. All elements and papers are from the Sundae of Seasons CD and I simply added some pearls and jewels for a little bling. Easy peasy! 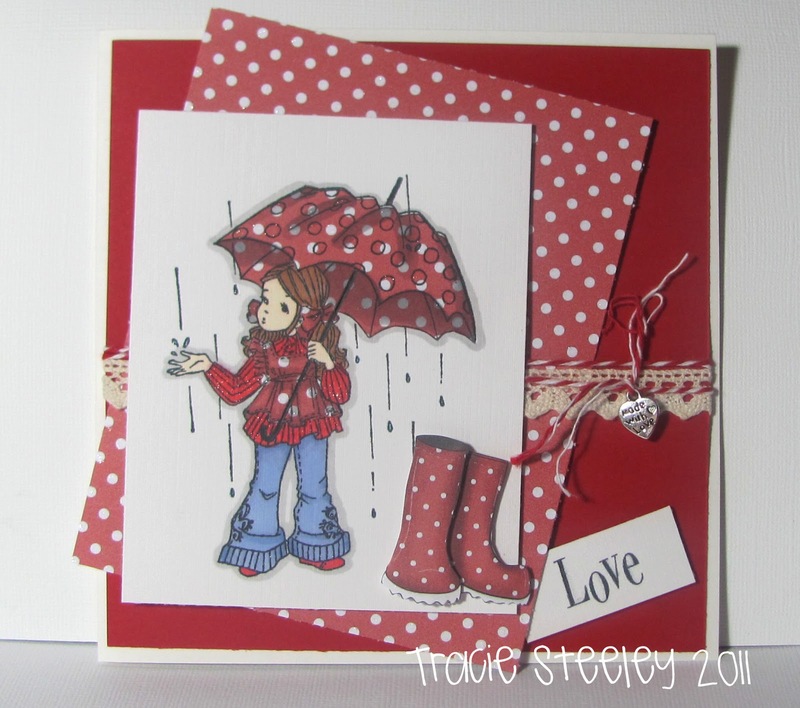 Tracie: I took inspiration from the rich colours of chocolate and made my card in browns and creams. I used Gracie hand coloured with promarkers, papers from Sundae of Seasons, and the gorgeous new Cherish around the page punch set. Lou: I have used the Sundae of Seasons CD to make my card. All the images can be found in the Summer section and using the camera tool in Adobe, I cut images I wanted to use and made my own topper sheet with all the elements I wanted. The large tag in the background is removable and can be used for other things (!). The little sentiments I wrote, cropped up and then mounted over the front of the card.Card was finished off with some gems, flowers and biased binding ribbon. Good luck - the deadline is Sunday 27 February at 12noon GMT. 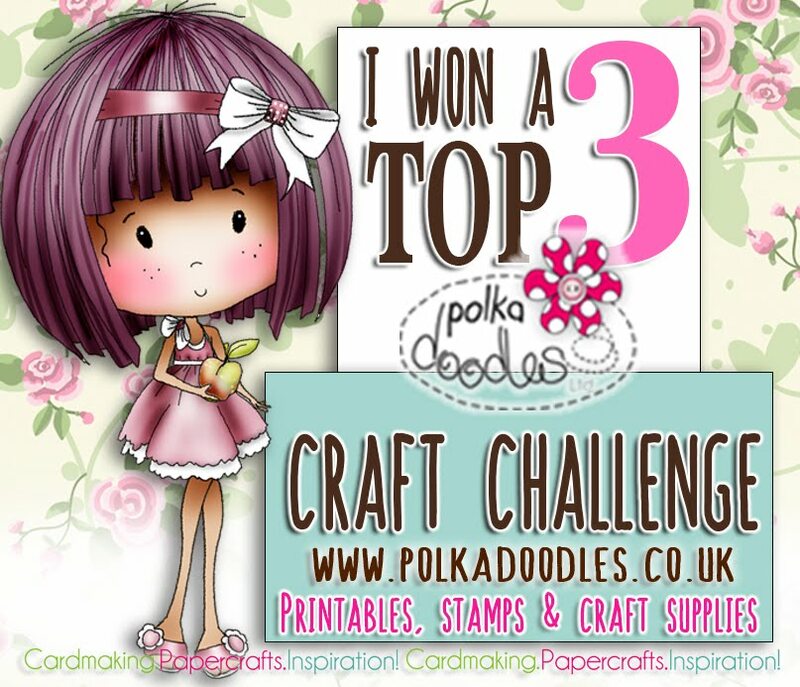 It's Friday so time for another Polkadoodle challenge! This week I (Miria) am your hostess and my theme is That's Amore! - I ask you to create a project related to a love song or a romance film. Congratulations! Please email Nikky with your place number and challenge 4 in the subject header. If you are in or near Skipton, North Yorkshire tomorrow (Saturday 12 February), Nikky is demonstrating at Embsay Crafts between 11am and 4pm. You never know, you just may see some of her Design Team there!! Right, back to the eye candy! Miria: My card is inspired to Love Story, a film that I loved so much when I was a teenager lol! I made an easel card using colour stampies and papers from Sundae of Seasons. The quote and the title are computer generated and buttons and lace from stash. Put on your thinking cap and if you are stuck for inspiration, just have a look at my teamies' fab creations! Ruth: I've gone for 'Breakfast at Tiffanys' by Deep Blue Something as I've never actually seen the film! I've used the very fab Recipe For A Great Day template from Paper Boutique Vol 3, layered it up with foam pads, added two sparkly brads, some ribbon and a bit of glitter glue here and there! Fliss - My easel card was inspired by The Beatles' song 'All You Need Is Love' and as you can see it has plenty of that. 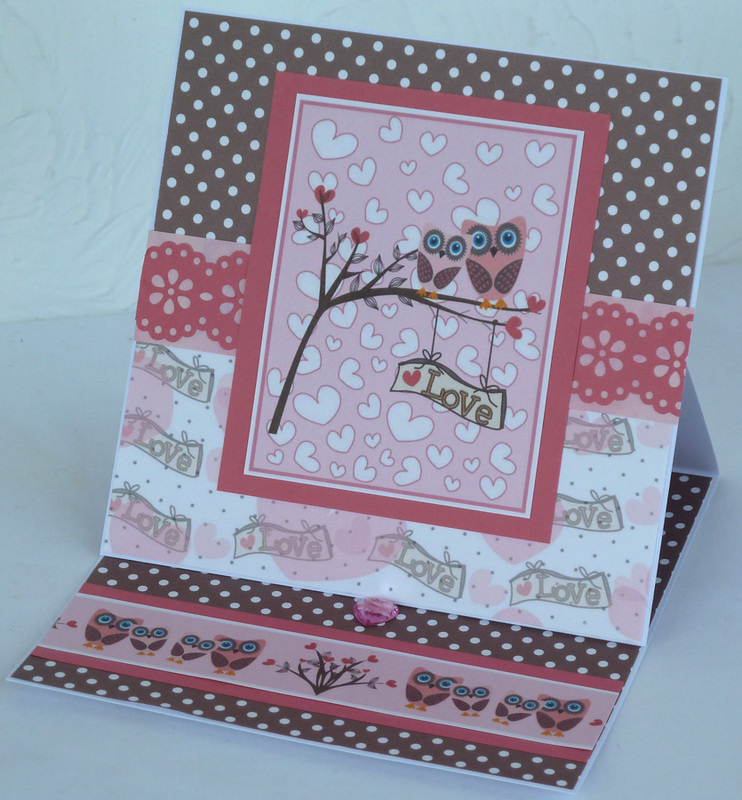 I decided on a pink and chocolate brown colour scheme and the gorgeous owls and love themed paper came from the Love and Cherish CD. The polka dot paper is from the Sundae of Seasons CD and all I added was some punching with a Martha Stewart punch and a heart shaped jewel stopper. D'Anne - Welcome Friends! My card was inspired by the song 'You Don't Bring Me Flowers' by Barbra Streisand. The recipient of this card will receive a wheel barrow of flowers. The digital papers and elements are from the Spring collection on the Sundae of Season CD. Saskia - Something sweet and yummy while enjoying 'Pretty in Pink'!! Papers are from the Sugar Birdies Collector's Edition cd-rom. Audrey For this project I used Sundae Of Seasons CD for everything polka dots. I printed out the images twice to give them some definition and used Glossy Accents on all the polka dots to make it look like there are raindrops on them. 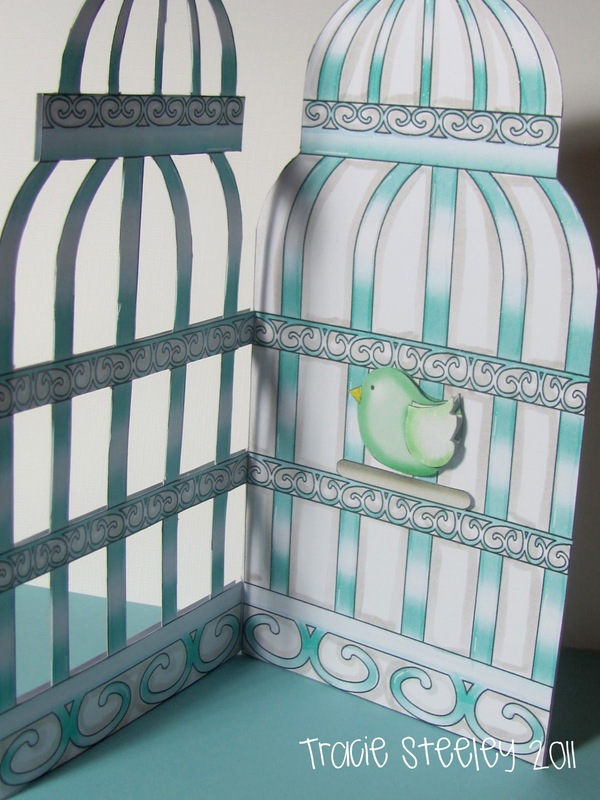 Colette - For this project I have used the owl, papers and flowers from the Sugar Birdies Collector’s Edition CD Rom. The sentiment is computer generated and buttons are from stash. Now I must apologise for this next part in advance but here goes, the song I've used is 'Owl always love you' by the fabulous (oh nooo, here it comes) ...........T-wit-ney T-whoo-ston, sorry I just couldn't resist LOL! Lis-m: I have made a quick and easy card this week featuring the Sundae of Seasons cd. My inspiration was 'Bee my Baby' by the Ronettes, as featured in Dirty Dancing..! The bees and hive are from the summer part of the cd and the yummy lemon ditsy print paper is from the greens section on the papers. Raffia bow to finish! Dee: I have to say, this challenge had me a bit stumped. I really couldn't think of a love song or film that I could make a project for. The more I tried the more I couldn't think, well I am getting older now, lol. I did however finally think of one so my card is 'two hearts beat as one'. It is an overload of pink though, it would have to go to a fan of the colour. I over-stamped the hearts and the main backing paper with some lovey-dovey stamps I had, in for a penny in for a pound I went the whole hog on this card. All the papers and elements are from the Love and Cherish CD. I added clear dewdrops and some ribbon, all of which can be found on the Polka Doodles website. Lou: Not a "love song" sort of person so struggled to think of a lovey dovey song that I liked and having no working printer at the moment fustrated me further! Well after looking through my "toones" on the computer, finally decided on "Truly, Madly, Deeply" by Savage Gardens. I have used the ever so versatile barocque style stamp from the "Daisy Doodles" collection to create all my detail; the border strips & the lickle toppers. A little embossing, velvet ribbon and shocking pink vellum add a touch of texture to the card along with some gems and metal staples (used as hangers)! Decorative edges created with a Martha Stewart punch. Deadline for the challenge is Sunday 20 February at 12noon GMT and please remember to follow our little rules! Good luck! It's Friday so time for another Polkadoodle challenge! 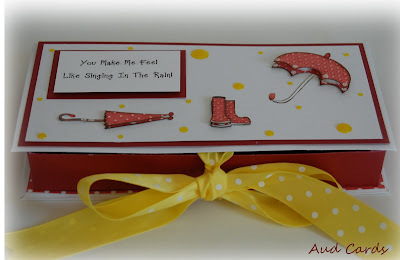 This week I (Ruth) am your hostess and my challenge to you is to create a project with Hearts! If you are stuck for inspiration, just look below at what the Design Team have created - bet you didn't realise there were so many ways to use hearts! Did you see Nikky on telly last weekend? Great samples from the Design Team and shows just how versatile her latest cd Paper Boutique Vol 3 is (my personal favourite is the Cupcake!) Oh, if you are in or near Skipton, North Yorkshire next Saturday 12 February, Nikky is demonstrating at Embsay Crafts between 11am and 4pm. You never know, you just may see some of her Design Team there!! Congratulations! Please email Nikky and put your place number and challenge details in the subject header. Ruth: I just cannot resist the wonderful cupcake from Paper Boutique Vol 3 - and my youngest keeps telling me to make more as he thinks they look great! 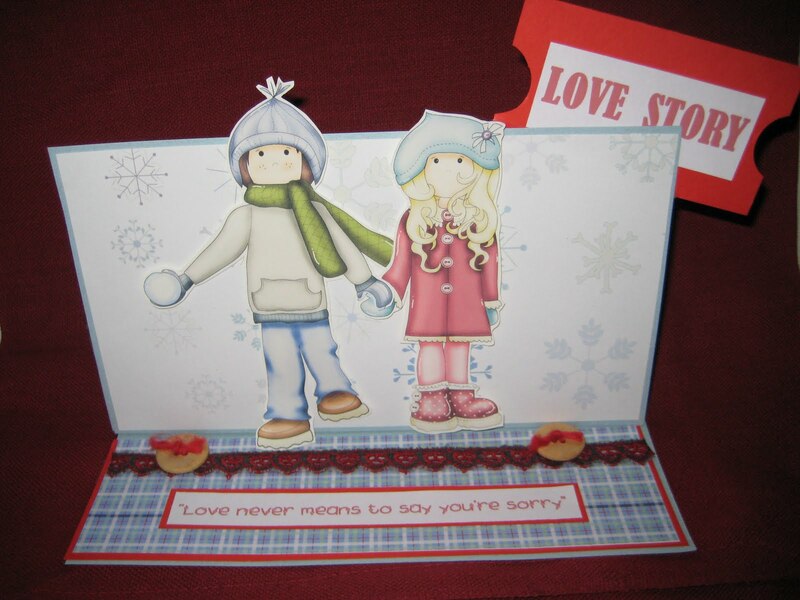 I've simply layered up all the different elements with foam pads, added some ribbon sent to me by Jenny, hand wrote the sentiment, then punched some hearts, coloured with Promarkers and liberally glittered them! 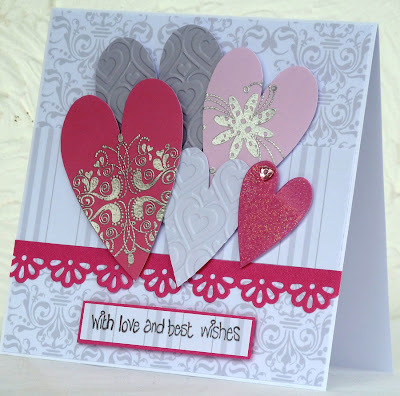 Fliss: I've used the gorgeous hearts from the Love and Cherish CD for my elegant pink and grey card and cut out the hearts inside the lines as I wanted to dress them up a bit. I embossed the 2 grey hearts with a Cuttlebug folder and wet embossed the smallest pink one with crystal embossing powder for some bling. The other hearts were stamped with some of the lovely flourish designs from the Daisy Doodles stamp set and embossed with silver powder. 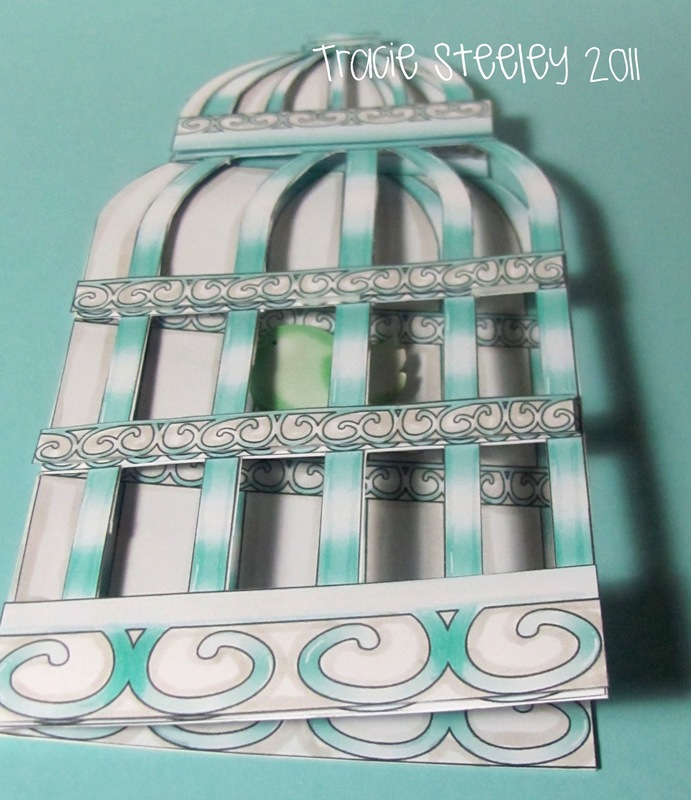 I used some of the elegant grey papers from the CD and a greeting from the stamp set. Lou: I have no printer at the moment so relished a bit of a stamping fest! The colours came about because I managed to find some paper left over from a previous project (Back to Nature CD). I have stamped one of the NEW house stamps and coloured with Promarkers. Added a flower and wire twirls with a few glittered heart beads. Saskia - Love is in the air! I made this card with a template and papers from the All Around and Everywhere cd-rom! Isn't it cute? D'Anne - My card set is card 'Heart Strings.' 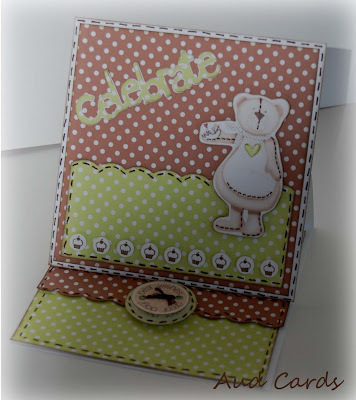 The card box holds a set of four - 3 1/4 x 3 1/4 cards which were created using the Black Polka Dotted frame from the All Around and Everywhere CD as well as, the Summer Papers and Stampies from the Sundae of Seasons CD. I embellished with ribbon and a rhinestone heart. The center of the box holds two chocolate hearts to enjoy later. Claire I have used Paper boutique Vol 1 again this week for my card. I decide to add a holographic background with the birthday girls name. I have layered up the image for depth. Added glossy accents to the hearts, Stickles to the icing and some sticky gems to cake. Secured the card with some wool and a felt heart! Audrey For this card I decided to use my Cricut along with the Love and Cherish CD. I thought that the bird looked so cute with the paper from the CD. I did some inking on the edges of everything and added some 3D dots for dimension. 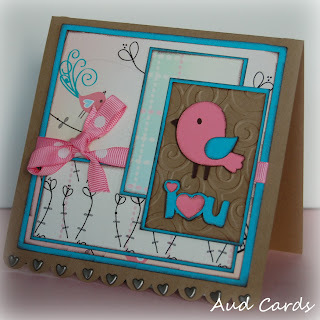 I used some heart brads on the bottom of the card and topped it of with a little pink ribbon from my stash. Colette - I used Paper Boutique Vol III for the elephants, and paper from Love and Cherish for the heart shaped background, I added eyelashes and a bow to one of the elephants and acetate and punched hearts to give the effect of them spraying hearts from their trunks. Lis-m: I have used shades of pink today. The background paper is from Love and cherish as are the larger dots, the smaller pinker dots are from Sundae of Seasons. I have used Babsie from the flutterfly Fairy stamp range, coloured her in with Promarkers and given her a string of hearts to hold. 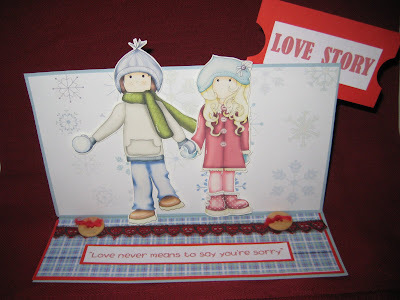 Miria This is a quick project you can give to your loved one with a gift. I used the seed template, the paper and the oval from Sundae of Seasons, I wrote the sentiment, the ribbon and charm are from my stash.I punched some small hearts to simulate the "seeds". 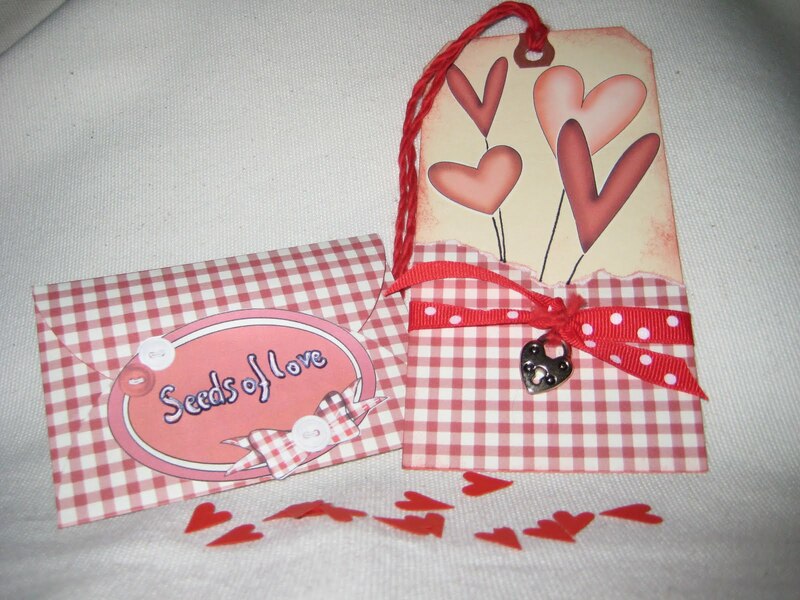 Emma Hi there, a very simple card again - I used Kraft paper for the background then cut a heart shape from the red gingham paper on the Sundae of Seasons CD, faux stitched it then adding some of the lovely buttons from the same cd, finally added a doodled swing tag - easy peasy! 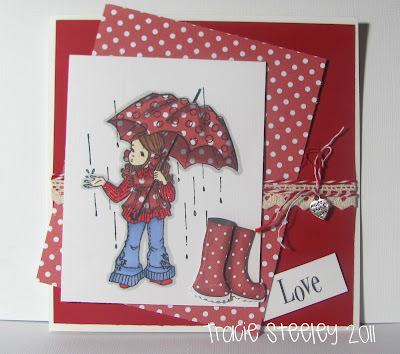 Tracie: I used the gorgeous Gracie Flutterby stamp, coloured with promarkers and cut with a scallop punch. I added some hearts from Sundae of Seasons and a sentiment on promarkered card. Good luck with the challenge - you have until Sunday 13 February to enter at 12noon GMT!